I have had my portable infrared sauna for almost a year. I admit that I haven't lost a ton of weight, mostly due to lack of motivation. However, this year 2011, I'm well motivated and have been using the sauna about 2 - 3 times a week. I fight arthritis and it helps tremendously with pain. I can't express to you how much I feel better overall. It has definitely helped my joints. I consistently used the sauna during January and I have lost a total of 8 pounds. I have also added a regular 2-3 day workout and healthy eating. I also journal what I eat to better gauge my calorie intake. 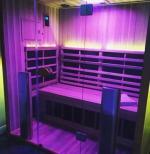 I highly recommended purchasing an infrared sauna, not just for weight loss, but for overall health.